SCITCS presented a proposal (See ABOUT US to download) in March to the Hon. Gary Mar MLA to consider the establishment of an accessible Provincial Park fixed roof facility in the Northern part of the Province. We identified a need for a totally accessible rental van that a person with SCI could drive. We spent a year exploring this with lawyers, personnel from Shoppers and Driving Force (a rental company) we commend Jeff Polovick and his management team of Driving Force who have included two fully accessible vans for rent, anticipated arrival 2006. Glenrose Hospital neurological unit. 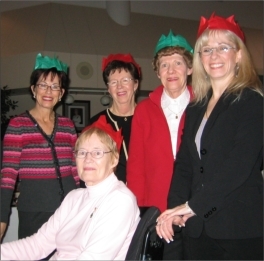 Thirty people attended the first SCITCS Christmas dinner that was catered by Elizabethan Catering Services. SCITCS has held monthly pizza parties for the 15 patients on the neurological unit and their guests for the past 23 years. The Never Say..”Never” golf tournament was by far the most successful in the16-year history of the event. 150 golfers participated. 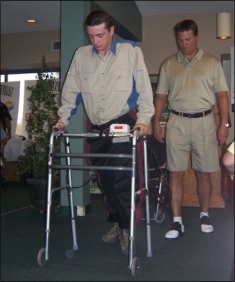 Scott who has paraplegia demonstrated walking using Functional Electrical Stimulation (FES) SCITCS has donated over $500,000 to promote and support applied FES research. See video of Scott walking in SCITCS NEWS. See www.craigsimpsoncharity.com for tournament updates. Louise received the Alberta Centennial Medal that recognizes and honours the outstanding achievements of Albertans who have gone to great lengths to make their Province a better place to live, work and do business. The new equipment will be a part of applied FES research that will take place in the SCITCS FES Research Laboratory created and named June 2006 by the Faculty of Medicine and Dentistry at the University of Alberta. 2006 June 20th the Faculty of Medicine and Dentistry created and named the “SCITCS FES Research Laboratory” to recognize SCITCS donation of two SpectraSTIM 4M 4 channel muscle stimulators, two Ergys 2 Clinical Rehabilitation Systems and Accessories, one Ergys Data Management Station, a Concept ll rower with adaptations and an Arm Cranking Trainer with the ReHa stimulator. The first of its kind in North America. 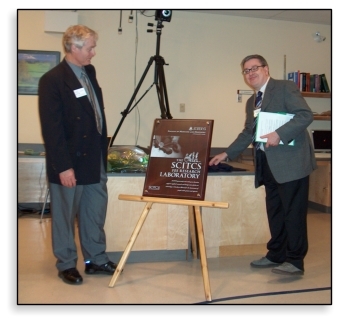 John Miller President SCITCS (L) proudly accepts a commemorative plaque from Dr Jody Ginsberg MD Vice-Dean of the Faculty.